It’s Pot Pie Season at Zingerman’s Deli! Oh yeah, they’re BACK! Handmade Pot Pies to warm your winter blues! Try all six delicious flavors: Classic Chicken, Two Tracks Turkey, Fungi, Darina’s Dingle Lamb, Red Brick Beef and Cheshire Pork, $10.99/each. Buy 10 or more, get 10% OFF! Buy 20 or more, get 20% OFF!! Buy 30 or more, get 30% OFF!!! Wanna be the coolest neighbors on the block? Download a Group Pot Pie Order Form! Call your friends and go in on this amazing deal only offered this time of year. (We’re pretty much tellin’ ya how to cheat, but we think our Pot Pies are so good we can’t keep this secret to ourselves.) Get these yum yums in your tum tums! Pot pies were around long before this 18th-century nursery rhyme. Their origins stem from antiquity and were a popular item on Roman banquet tables (some were known to be filled with live birds!). Elizabethan gentry of 16th century England spurred a renaissance of the ancient custom of meat pies, which were elaborately decorated and very popular among royalty on both sides of the English channel. These pies featured not only poultry but pork, lamb, and wild game, as well. Savory pies were popular among commoners, too, providing an economical and filling dish for the laboring masses. Meat pies are featured prominently in many cultures’ collection of traditional foods. 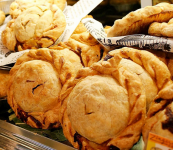 Cornish pasties, which were transplanted to the iron and copper mining towns of Michigan’s Upper Peninsula, Galician empanadas, and Ligurian torta pasqualinas (easter pies) are all examples traditional savory pastries. New Year’s Day kicks off our annual Pot Pie Promotion. For two months, through February 28th, the Deli is awash in a collection of six kinds of handmade pot pies. 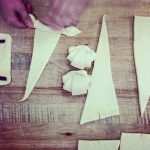 Kitchen cooks commence assembly in early December, just after Thanksgiving, and amass hundreds of pies before the promotion begins just to be able to keep up with demand. Each pie is made from scratch. Vegetables, herbs and meats are chopped and minced, then cooked in butter, thickened with a roux and drenched in broth and cream to make a rich, savory sauce. As the filling stews, we start preparing the crust. Butter cuts into flour and is bound together with ice cold water and a pinch of sea salt to make a rich dough. We give the dough a brief rest and then portion each batch into seventy-two pieces which are then rolled into thin discs, two for each pie. We usually make two to three batches a day from December through February. We’re planning on selling at least 9,000 pies this year so that’s over 300 batches and 18,000 portions of dough! Once the filling is cooled and the dough rolled out we then set upon the task of assembly. Each pie is made by hand, enveloping a heaping scoop of filling between two folded layers of buttery crust. Classic Chicken – Our most popular pie featuring diced chunks of Amish chicken, celery, carrots, onions, button mushrooms, red and green bell peppers, red skin potatoes and thyme swimming in a rich sauce of housemade chicken broth and Calder Dairy heavy cream. Two Tracks Turkey – This one is fairly similar to its feathered cousin, except that we use Broad Breasted Bronze turkeys pasture raised near Grass Lake, MI. We also add a bit of Turkish urfa pepper, a dark purplish pepper that is sun dried by day and wrapped and “sweated” by night for over a week to bring out a rich, earthy flavor and smoky aroma. Fungi Pot Pie (Vegetarian selection!) 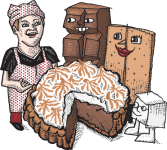 – Chock-full of four varieties of mushroom (Michigan maitakes, shiitakes, oysters, buttons), this pie is teaming in earthy flavor. To enhance its distinction we add Balinese long pepper, once acclaimed by the Romans as the ultimate peppery spice, this cattail-like pepper grows wild in the forested central highlands of the Indonesian island of Bali, surrounded by coffee, vanilla and spice plantations. It adds a nuanced floral sweetness to this delectable dish. Darina’s Dingle – I don’t recall meeting any miners in pastoral County Dingle, Ireland but I do remember seeing tons of sheep. This pie is served pastie style (without a tin) and features lamb from Hannewald Lamb, near Stockbridge, as well as loads of potatoes, carrots, celery, onions and rutabaga. A hint of toasted cumin and rosemary give it extra mouth watering appeal. The idea for this pie was originally inspired by Darina Allen, friend and teacher to both Ari and Rodger, and owner of the famous Ballymaloe Cookery School in County Cork, Ireland. The Red Brick Beef – Imagine a hearty beef stew wrapped in a buttery crust and that’s exactly what you’ll find in this bullish pie. Our beef is grass fed and comes from Michigan State University’s Lake City Research Farm, a farm dedicated to improving the beef industry’s environmental impact. The beef is diced into big cubes and then stewed in dry red wine with carrots, celery, onions, garlic, bay leaves and fresh thyme. The outcome leaves nothing to be desired except for, perhaps, a second helping. Cheshire Pork – I don’t like to play favorites but if I had to choose one, our pork pie would have to be it. This recipe derives from a thorough combing of traditional British cookbooks one afternoon at the library many years ago. I think it is our most unique pie, combining sweet, sour and savory in a delicious concoction. Chunks of local pork, raised by Alvin and Joan Ernst, are braised in fresh apple cider from Nemeth Orchards and Gingras apple cider vinegar from Quebec, along with onions, rosemary, freshly grated nutmeg, lemon zest and large bites of apples, also from Nemeth Orchards, for a truly amazing and distinctive treat. As with the Darina’s Dingle pie, this one is also served pastie style, without a tin. Enjoy a steaming hot pot pie this winter season and thanks for reading! Pot Pies! Pot Pies! Pot Pies! Pot Pies! Brand New Class Schedule at BAKE!